But now, I’m ready to share some design gems with you. It was on the side of overwhelming how much incredible design there is in London. It’s a special place and oh so inspiring. We hunted down some of these spots with all the sleuthing of a seasoned designer; others we stumbled across by accident. Happy, happy accident. Sketch Gallery is the coolest place IN THE WORLD. I’ve been wanting to go for years and see those amazing zig zag floors. 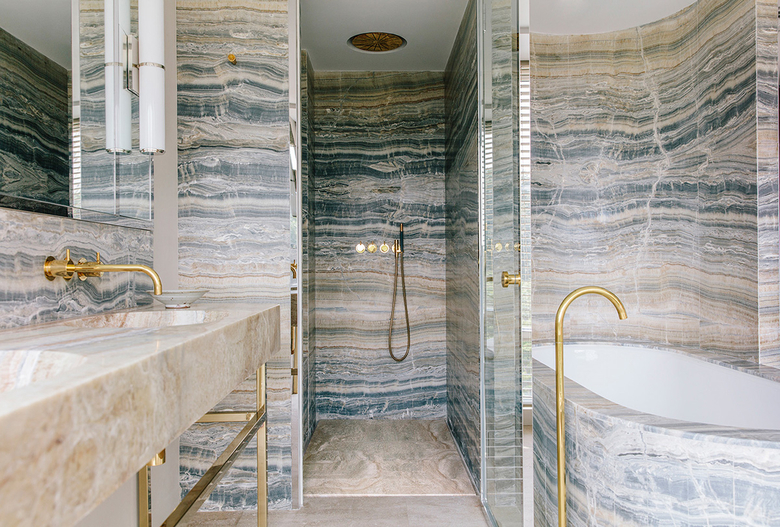 The place is designed by India Mahdavi and is breathtaking. It is dripping with interest and whimsy. Yes, dripping. It will exceed all of your expectations! As a Britain-based designer she’s one of the best and designs spaces all over the world. I’m a big fan of her furniture too, especially the together table. Her use of materials is incredible. Think lush, textured, interesting, but never overdone. Check out her portfolio! Seriously incredible. There are SO many incredible vintage shoppes to see in London on Portobello Road! My favorite was this gem, Henry Gregory Antiques. Filled to the brim with globes, leather trunks, croquet balls, old silver, and so much more. You can actually shop them on Instagram! Of the other antique shops, I especially loved the ones filled with door and cabinet hardware. They were bang on, London. Bang on. Okay, this one’s not a design shop, but this restaurant designed by Brian Fitzgerald was so beautiful. Every detail is absolute perfection, and the food is delicious too. It’s the perfect place for a special occasion. I’ll wrap it up here, but there’s more where that came from. If you’re heading to London anytime soon, feel free to reach out for recommendations. In the meantime, you can subscribe below to receive more inspiration and updates from us throughout the month!